Themes - Architectural, Community development. John Brown purchased a lot of land on School Street for $75 from Timothy Osgood on May 1, 1825, recorded Apr. 28, 1827. John Brown built the first home on the site. He later sold both his own home at 134 Main and the home at 41 School St. to Samuel Valpey and Merrill Pettingill on Oct. 9, 1827. 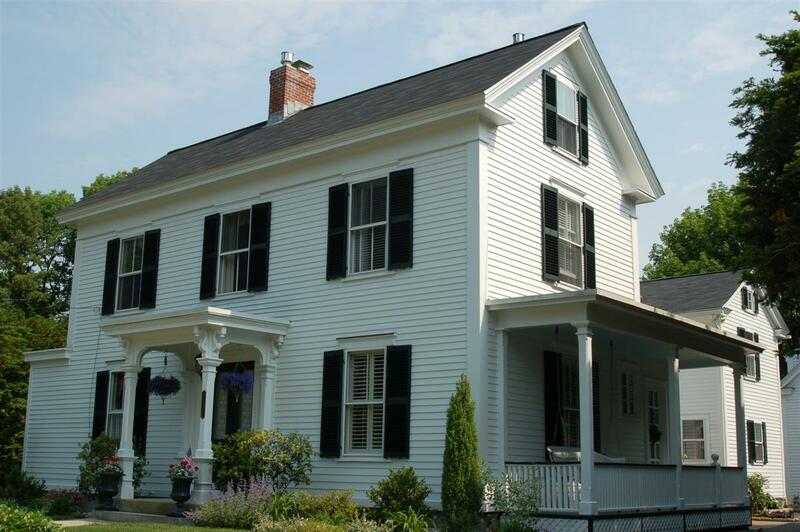 John Brown built seven homes in Andover, his first the Amos Blanchard House at 97 Main St. home of the Andover Center of History & Culture. Peter French Jr. purchased this Brown property on June 16, 1828. Peter had purchased two adjoining lots on School St. from Daniel Wardwell 3rd on June 4, 1828. French then sold the Brown dwelling house and lot to Deborah (Sparhawk) Pearson on June 9, 1828. Deborah was the widow and second wife of Dr. Abiel Pearson. They married in June 8, 1816. Dr. Pearson born in 1756 and died May 22, 1827 at the age of 71. Deborah died on October 12, 1838 and her estate when to the Pearson heirs. 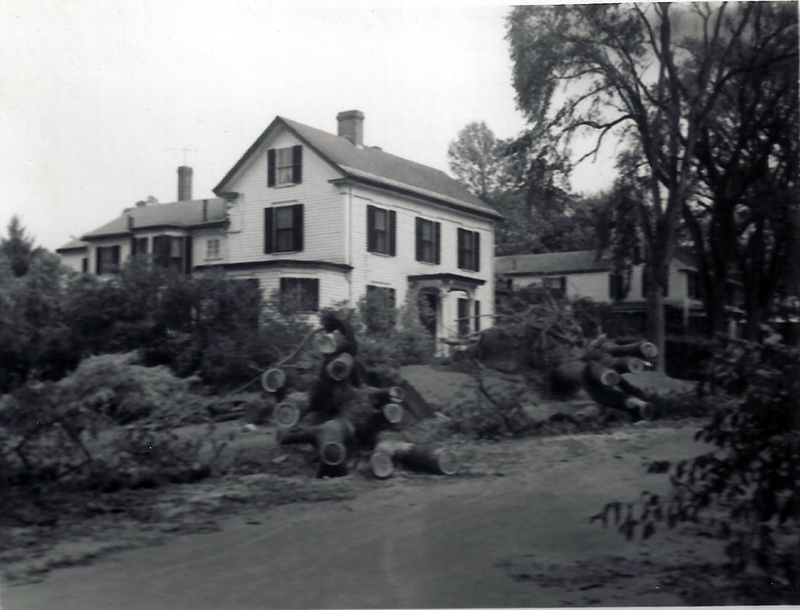 The property was sold back to Peter French Jr. on April 23, 1839 for $850. French held the property six years then sell to Moses Clement, wife Mary on May 6, 1845 for $750. The 1852 & 1855 maps of Andover list M. Clement at this house. Moses Clement was an Andover carpenter, merchant and business man. Clement may have added to the house. Moses sells the property to Samuel Lawrence of Boston on April 1, 1854 with buildings. Samuel Lawrence was a merchant in Boston with partners: Oliver Perry of Andover, William U. Stone and Henry F. Jenkins of New York in the firm of "Lawrence, Stone & Company" of Boston. In 1858 the business was declared insolvent, and the courts appointed Charles D. Head of Brookline, MA a broker and John Lowell, an attorney, to settle the debts against the company. The property was ultimately sold to Joel Phelps, a cordwainer. Phelps also had to pay off the outstanding mortgage, $778.37, held by Issac Wilson of North Andover. Joel Phelps, wife Lucinda, took ownership on Dec. 10, 1858. Phelps owned for nine years then sold to E. Kendall Jenkins on April 10, 1867 for $1750. Edward Kendall Jenkins had purchased the Peter French House and property next door at #39 on Sept. 13, 1865 for $2100. Jenkins held for two years, sub-divided the lot and then sold this property to Henry E. Hayward on Apr. 14, 1869. July 30, 1869 Andover Advertiser pg. 2 col. 7 - Henry E. Hayward bought the Joel Phelps house on School St. and moved it back on the lot to create an ell and will construct a two story residence which will be one of the finest on the street. The ell to the rear is the original Pearson - Phelps House, built by John Brown in 1825, and the Hayward House now fronts School St. built in 1869. Two houses in one. Henry E. Hayward was born in 1815 and married Polly S. Curtis b. 1810. Andover vital records list five Hayward children; Helen Elizabeth b. Jan. 29, 1838 d. 19y 4m., Harriett Eliza b. Feb. 3, 1839 d. Dec. 29, 1917 age 78, Henry Albert b. Jan 6, 1841, George E. b. Feb. 13, 1842, d. July 24, 1865 age 23y 5m, (wounded in the battle of Spotsylvania, VA,) and Charles Warren b. Sept. 18, 1843. Henry E. Hayward died on December 27, 1875 and Polly continued to reside at the home. Polly died on May 1, 1896 and the estate was sold at public auction on August 29, 1896. The property was purchased on Sept. 1, 1896 by Nancy Jenkins, wife of E. Kendall Jenkins abutters to the Haywards at 39 School Street. The Jenkins family owned for 25 years before selling to Lillian Sleicher Chapin on May 31, 1921. Brown to Samuel Valpey and Merrill Pettingill - Oct. 9, 1827 - b. 247 leaf 120 w/blds. Pickwell Builders Inc. - Apr. 26, 1984 - b. 1804 ?p. 292 ? Acreage less than one acre, 28,810 sq. ft. 187' frontage.